Joana Cortez-Smyth (MA in Second Language Studies) is a researcher and lecturer at the University of Coimbra. 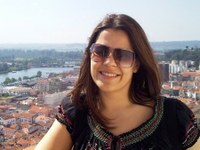 She has been teaching Portuguese as an additional language for the past sixteen years, both in Portugal and abroad. She currently also collaborates with Literature Ireland as an expert reader for Portuguese translation proposals. Bilingualism, translation and pragmatics are her main areas of interest. She is a member of the UC Digital Humanities group and also a researcher at the Centre for Applied Linguistics.